But Jason Jaspersen has found much success and happiness in his life without graduate school. He has made art his own vehicle for service to the many elements of his life. Jaspersen lives and works in New Ulm, Minnesota. He has a job teaching at MinnesotaValley Lutheran High School, and also executes a number of commissions around the region of southern Minnesota. I had the luxury of being one of his students for a few years, both in high school and at a summer art camp. I sat down with Jaspersen for an interview in January of 2008, just a few days after his thirty-first birthday. 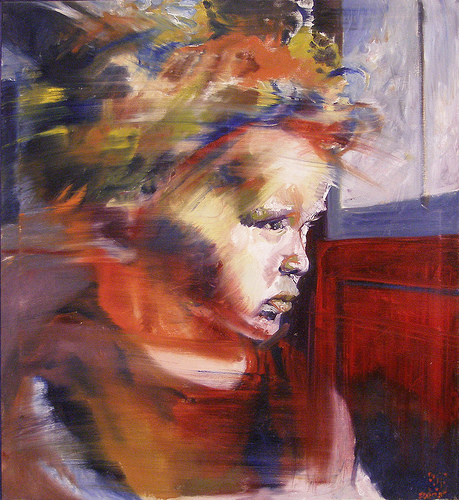 My first instruction from Jason Jaspersen came from Young Michelangelo Art Camp, which is also the same art camp that Jaspersen attended in his youth that helped expose him to art. Prior to art camp, Jaspersen was mostly into comic books and spent many hours over the next several years working to become a serious comic book artist. But while he worked towards this goal, he was also attending art camp and being exposed to the Impressionists and the titans of the Renaissance. Jaspersen would memorize the names of the Impressionist and Renaissance artists and then head out to the public library in order to look up books on them. Both of these interests were fused together with the influence of Jaspersen’s grandmother, an immigrant from Japan who was an accomplished Sumi ink painter. Another important influence came form his parents. Jaspersen recalled how supportive his parents were, especially with keeping him grounded. “Without my parents I don’t know if I would be an artist. They’ve been very supportive and understanding, and always doing what they can to help.” Jaspersen mentioned how his parents would buy supplies for him, some of which he still has to date. The drafting table I set my computer up on during the interview was a gift from his parents from when he was a teenager. Over the years, Jason Jaspersen has worked intensively in the medium of sculpture. When in college he received a block of marble from his uncle in Colorado and Bethany Lutheran gave him permission to carve it in the utility closet of Larson Hall. “I was living there with 5 roommates. It was like having a personal studio. I haven’t thought about that for long time. I had previously tried carving cement blocks that I stole from Artstone andKasota stone and Quartzite that I picked up in highway ditches. That marble was important. I can still remember the smell of freshly chiseled marble.” Sculpture appealed to him because of the unknown qualities, and because he knew few people who were sculptors. He also enjoys the physical labor behind it, especially the satisfaction he gets afterwards. 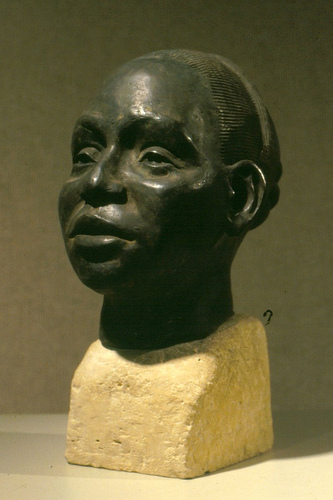 One of his early sculptures was a bronze head of a student at MSU-M named Makeba. The sculpture was a realistic portrait, and caused controversy because a professor wanted to feature the work in the art department pamphlet, but other members of the department did not believe realistic art was representative of the MSU-M art department. Nonetheless, Jaspersen felt proud of the work and entered it in the Prairie Lakes Regional Arts Competition, and won second place. From that sculpture, Jaspersen’s name spread to a woman in New Ulm who was looking for someone to take up sculpting a portrait of a retiring city worker of New Ulm. Jaspersen accepted the commission, and later was led to other monuments such as Gertie Goose and Saint Anthony. With his public works, Jaspersen is always on the lookout for possible misinterpretations and physical dangers of his work. Jason Jaspersen is proud of his commissioned work. He sees himself as fighting against the popular belief that commissioned art is less noble than non-commissioned work in a gallery. Also, he sees art with a political message as a disservice. “I’m not impressed with art with an agenda,” he said. “It’s propaganda, and it’s taking advantage of current events. What does that work mean after those issues are done?” Jaspersen is not into shock value with his art. He does not buy into the stereotypes of the starving and tormented artist. “We have the same clichés about politicians and movie stars. Certain things make good press.” He does identify himself as a Christian artist, but he says, “Christian art doesn’t have to be pictures of Jesus all the time.” He sees art as something that Christians should embrace, especially since so many conservative Christians shy away from it. When asked about possibly going to graduate school, he says he doesn’t see it as anything necessary, and from his current stable situation, he doesn’t seem to be in any desperate need for it. He recently has been given a brand new studio space at his school, and is quite content with it. Jason Jaspersen does not know where life will take him in the next few years, but he would be content with staying in New Ulm and continuing to teach for the rest of his career. Ultimately, Jaspersen sees his art as service. It is a service to the community; it is a service to his religious faith; it is a service to his students; and it is a service to his family.